FLPs have been around for years, but they are just now becoming popular, primarily due to their significant tax advantages under recently-passed laws. They are also relatively easy to set up, but the attorney must be very experienced in these matters, since some complications can arise. Essentially, most FLPs have one general partner who handles the day-to-day functions of the limited partnership, along with one or more limited partners who are usually the general partner’s children. These limited partners acquire greater and greater shares as time goes by. FLPs are not for everyone. There is often a substantial startup cost, because the assets must be independently appraised, in most cases. Second, although monetary accounts can technically be part of the partnership assets, FLPs are not the best place for such assets. But in the right situation, Family Limited Partnerships have a number of advantages for Florida families. Since a family member is the general partner, the family maintains control over all the partnership assets, which usually include a house and various items of monetary and non-monetary personal property, like cars, furniture, and investment accounts. FLPs also streamline operational efforts as well as their associated costs. This consolidation is especially good for investment accounts. Since assets are in one place instead of several, more money goes to the investment account and less to account fees. Furthermore, since a trust can be a limited partner instead of a person, there is even more opportunity for diversification. This arrangement has advantages for the general partner as well. Creditors cannot touch FLP assets unless they have special permission from a Florida judge. In the unlikely event of a seizure, a buyback may even be possible. FLP assets are essentially divorce-proof. A non-family member cannot be a limited partner, so the other partners can purchase the illiquid share at a discounted rate. It’s also nearly impossible to commingle FLP assets. These advantages are even more significant if the general partner relocates to a community property state. Finally, FLPs have some unique features in terms of Florida estate planning vehicles. There is no fiduciary relationship between the partners. To evaluate decisions, courts use a business judgement standard instead of a higher fiduciary analysis. FLPs are also much easier to amend than irrevocable living trusts, which is the natural alternative. Asset transfers from parents to children within an FLP (general to limited partners) fall under the lifetime $1.2 million gift exclusion credit, making these limited partnerships excellent tax reduction vehicles. Additionally, the shares are discounted upon transfer. Many investors normally see transfers from general to limited partners as bad deals, because the limited partners have very little control over the money. Although that’s not the case in FLPs, because everything remains in the family, the discount rule still applies. Family Limited Partnerships are often excellent tools for people who want to preserve their financial legacies. 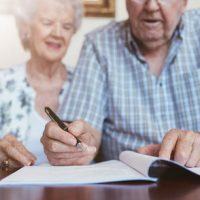 For a free consultation with an experienced elder law attorney in The Villages, contact the Millhorn Elder Law Planning Group. Convenient payment plans are available.